Disclosure: There are affiliate links below. If you make a purchase from clicking on one of my links I may receive a small commission. 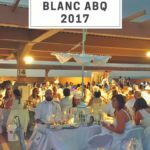 If you haven’t read my recap of Diner en Blanc Albuquerque 2017, you definitely need to check it out. But if you have, then you know that I had the privilege of trying some new product from White Appeal, and guys, I’m not gonna lie. I’m in love. 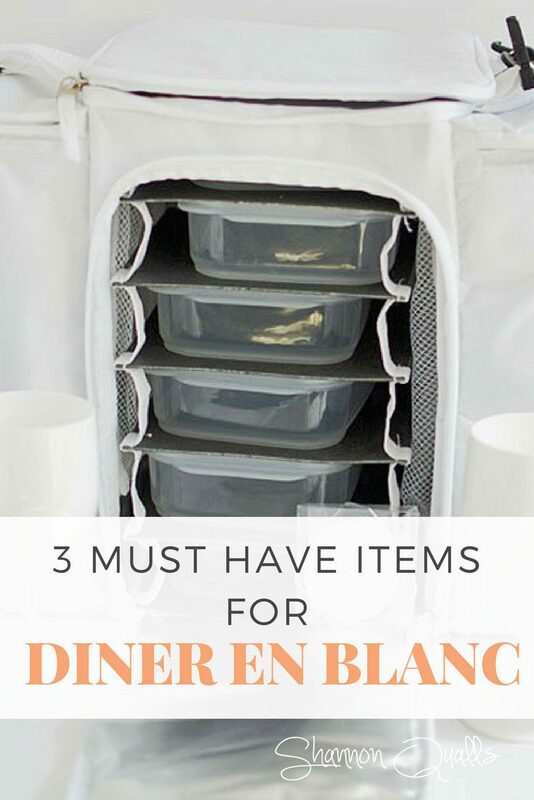 Are you ready to add 3 must have items to your Diner en Blanc list? Back in August the totally awesome Jonathan of White Appeal reached out to me about the possibility of us working together. To say I was stoked might be a bit of an understatement. Seriously. I’d seen their stuff before and was super intrigued to check it out. Unfortunately, between school starting for the kids, my husband taking care of work stuff and a bunch of other factors (my love/hate relationship with e-mail…I pretty much hate writing them), I took my sweet time getting back to him. 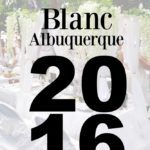 Thankfully he’s super gracious and understanding, so when I suggested trying out some of their product for our Diner en Blanc 2017 event, he not only hopped on it, agreeing to send it to me, but got it to me in time for our September 7 event (as in, over a holiday weekend- that’s commitment people!). I was getting my hair done when I got a text from my husband letting me know it made it here on time. I may have squealed a little. 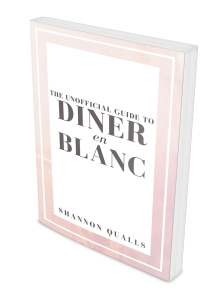 Now you guys know how much I love Diner en Blanc. If you don’t, then you can read any of the articles listed on the tab above. It is seriously SO fun. But one of the things you really have to consider when you go is space. You have to think about what you are bringing, where it will go and a whole other slew of items. In the past we’ve used a purple soft sided bag for carting our food around. While it got the job done, it also meant that we had to think about where it would be stored (under our table obvs- we couldn’t leave it out because it wasn’t white. I feel like the bag Jonathon sent us was a perfect solution. Especially since I was a bus/table leader this year and that meant we got to sit at the head of the table (re: extra space to put your crap- but ONLY if it’s white). Now before I go any further, I want to clarify a few things. Lest you think I’m getting paid a crazy sum of money to drum up this company, I’m not. I’m part of their affiliate program (that basically means I get a small commission if one of you lovelies makes a purchase using my link. It doesn’t cost you any more) and I was sent a few of their items to try out and write about. I didn’t get paid for this post and I definitely wouldn’t drum up their products if I didn’t believe in them, because that’s just not cool. 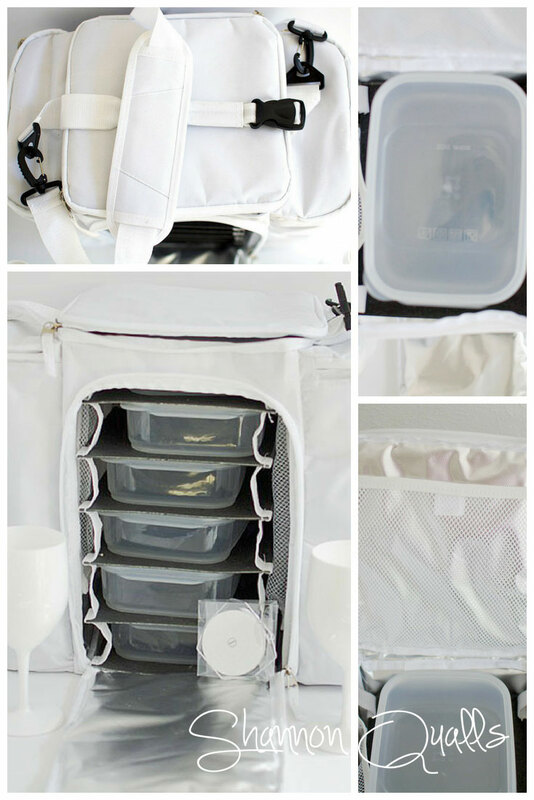 So what made this bag (The White Insulated Cooler Bag + Stacking Kit) so great that I felt I needed to share more info with you? It’s white. That’s kind of an obvious one, but as I said, if you can keep a bag by your feet and not have to dig around under the table, that’s a definite win in my book. 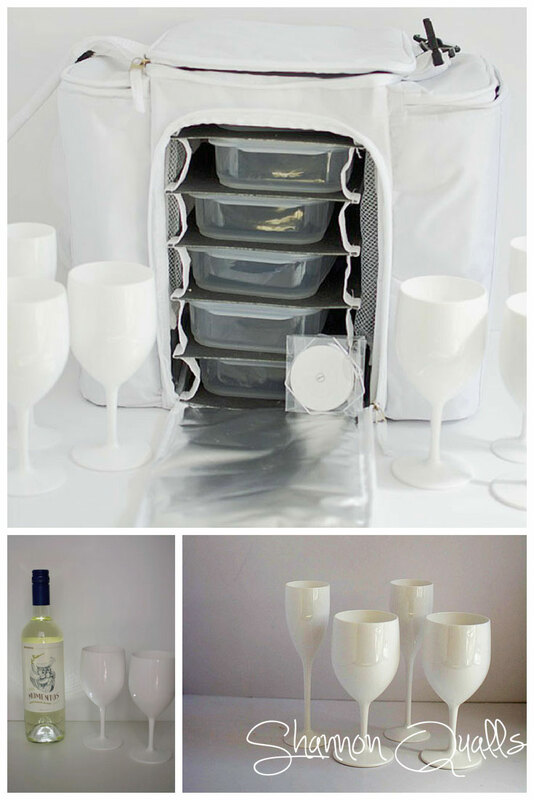 It has space on each side for wine, battled water or other drinks. You don’t have to use it for that, but I definitely loved that it had room for drinks already built into it. Bonus? It uses velcro dividers that act as padding. But if you don’t need it for wine (and we didn’t because it’s against the law in our state so ours was already pre-purchased and on-site), you can stack water bottles in it. I was able to fit 5 standard sized bottles into the space on each side. Quick tip- Chill your water beforehand and throw an ice pack in there with them. Which leads me to my next point. It holds a LOT of food. Six boxes on the stacking kit (if you get that one). I packed for four of us and we probably still had too much food. But better too much then not enough. Am I right? The stacking kit. I really liked that I didn’t have to DIG to get to the next course. Because of the design of the bag, I could unzip at the front and easily slide out the next course. That was definitely a nice advantage. Honestly, it was a really interesting design. I don’t know that I’ve ever seen a bag like it before and was pretty intrigued by it. It gives you some flexibility with your packing and I’m a junkie for options. I liked the shoulder carry strap. We didn’t have much need for it as we used a wagon this year, but it was comfortable enough that I wouldn’t have minded having to carry it. 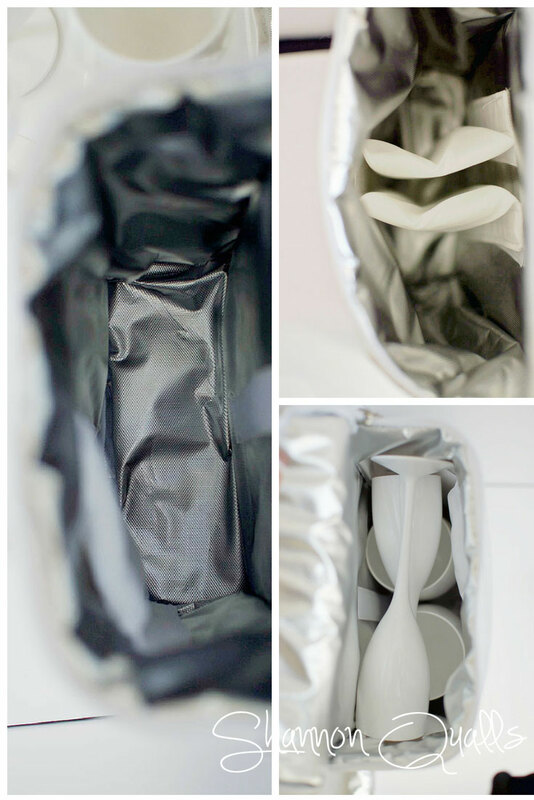 There was also a short handle to easily grab and maneuver the bag. Okay, so that was the good, the things I really liked about it. What about the bad? Honestly, there weren’t really any negatives- EXCEPT that one of the buttons that was supposed to hold the stacking kit up (because it can be taken out if you don’t need/want to use it for other events), didn’t seem to want to stay snapped. At one point during the evening I had a total collapse in the bag and ended up stacking the food containers in just because I didn’t want to take time to figure out what was wrong at the event. Afterwards I contacted Jonathan to find out what their policy is on something like this happening. Here’s what he said, “For returns, we’ll stand behind our products and exchange or replace parts if issues such as these come up. I had this bag custom-designed, so I definitely do want to see people happy about it!” And you know what? He 100% made good on that promise. After letting him know about the problem, he sent me a replacement insert. He also let me know this, “If you find the snaps are still too loose, this likely means that one of the snap buttons on the cooler itself is just a fraction of an inch smaller than it should be. The quick fix for that is use a pair of pliers and just gently squeeze the loose snap button on the organizer, so that it will be a tighter fit.” So there you go. Excellent customer service and a killer bag. So what else did I get to try out? Well, the peeps at White Appeal were super sweet and sent me some wine and champagne glasses to try out. I gotta tell ya, I was super happy with them. When I saw them online, I wasn’t really sure my feelings about them, but after seeing them in person, I can 100% tell you I would purchase them without any hesitation. While you may already have wine glasses that you like and would prefer to use (I get it! Believe me!) 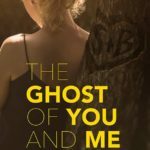 I think they are definitely worth a look and some consideration. They are plastic (and not like cheapy looking/feeling plastic), super light weight, and chic looking. Event better? They won’t break in the event you drop one (or worse- the wind picks up and some of your table gets blown onto the ground- yes, this did happen to one of the people in my table line this year). I was also sent a light for the bottom of our wine bottle, but in the moment, I completely forgot to try it out. So here’s what I did. I used it at home (hey! 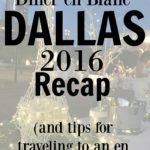 I had to give you some honest feedback!). Super fun and perfect for adding more lighting/ambiance to your table. Anyway, definitely give White Appeal a look and see if they have anything that may work for your event. What’s your favorite item on their site?